The Court has issued a ruling on Morgan (26 April 2018) and we had that translated. It is posted on the page Ruling, 26 April 2018 – and we recommend that you read the linked page about why we applied to have Morgan’s permit annulled to understand the framework of the Ruling. Orca Morgan Pregnant. Loro Parque in Violation! The controversy surrounding the wild orca Morgan continues. It has been announced that she is pregnant. Morgan was rescued in 2010 in the Wadden Sea and sent by Dolfinarium Harderwijk (The Netherlands) to theme park Loro Parque (Tenerife, Spain). The Dutch Ministry of Economic Affairs granted permission in 2011 for the transfer of orca Morgan to Spain on the strict condition that she be kept for research. 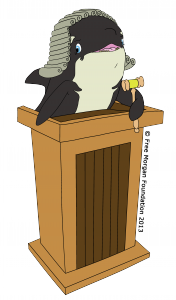 Morgan is a protected wild orca under European Union (EU) law and the CITES Convention. Under these rules there is a legal prohibition to use her for breeding purposes. However, Dr. Jorge Soares, head of veterinary service Loro Parque confirmed the alleged pregnancy in the Spanish online newspaper ‘ElDia’. These rules have been trampled on. The news about Morgan’s pregnancy comes only weeks before the 23 January 2018 court hearing for Morgan, in which the decision by the Secretary of State not to intervene regarding Morgan’s situation at Loro Parque is appealed. The hearing on the 23rd of Jan 2018 will provide the Dutch Court with its first opportunity to consider and decide fundamental issues of both law and fact which were not addressed by the Raad van State in its decision of 23 April 2014. Since that ruling, new evidence has emerged concerning Morgan’s welfare at Loro Parque including the failure of the Dutch and Spanish CITES Management Authorities to abide by the terms of Morgan’s exemption certificate and take affirmative measures to ensure that Morgan is not subjected to breeding. The administrative process we initiated in August 2016 to address these new concerns was a necessary procedural first step to bringing the matter before the District Court. We anticipated that the Dutch CITES authorities would not exercise their due diligence regarding the points that we raised administratively and the decision it rendered on 12 June 2017 confirmed the expected result, with the Dutch Management Authority failing to address the issues. This allowed us to officially file formal legal grounds for our concerns about Morgan with the Central Court of Appeal of the Netherlands. We have been notified by the Court that the hearing will be at Rechtbank Midden-Nederland, Vrouwe Justitiaplein 1, NL-3511 EX Utrecht, The Netherlands. The Appeal will be heard before a panel of three judges, indicating the Courts recognition of the serious nature and complexity of the issues at stake. The Court hearing will be open to the public and starts at 11 am. We encourage all those who have concerns about keeping cetaceans in captivity to attend. The proceedings will be in Dutch. However, as for Morgan’s previous court hearings, we will have a ‘whisper’ (simultaneous) translator but headsets must be pre-ordered (there will be a fee to cover the cost). We urge those who think they may attend and wish to use this service, to place their order as soon as possible to ensure there are enough headsets available. Contact us through info@freemorgan.org to arrange this. We have an ‘Attend Court’ ‘event’ page with more details posted as they become available. Additionally, there is a facebook ‘group’ ‘SupportOrcaMorganInCourt‘ and naturally, there is the official Free Morgan Foundation facebook page. Also, we have a Free_Morgan twitter account you may wish to follow. Morgan at Dolfinarium Harderwijk in June 2011. Note the water is too shallow for her to exhibit a normal body posture. This image is corrected for refraction (Morgan’s head as been moved to the right, but the depth has NOT been modified). in the waters of the Netherlands, was captured by theme park Dolfinarium Harderwijk, under a ‘rescue, rehabilitation and release’ permit. Unfortunately, the theme park never fulfilled the ‘rehabilitation and release’ part of the permit. Rather, the young orca, whom they called Morgan, was trained institutionalized behaviours, as well as undignified tricks. They kept her in a tank that was barely large enough for her to exhibit normal body postures, for 18 months. This was the start of a saga that continues today. Despite belonging to a species which is protected by EU law and prohibited to be used for ‘primarily commercial purposes’, Morgan was put on public display only weeks after her rescue. Importantly, this website provides the evidence we have collected and, as such, is a historic record of Morgan’s story. It allows members of the public, to understand for themselves, how justice failed her. 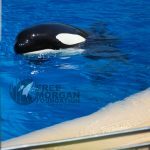 It shows that greed, not Morgan’s welfare, were the driving forces behind what has happened and how she is still treated, often kept locked in a tank even smaller than the one she was in whilst held captive in the Netherlands. This chronicle, perhaps the best documented case of ‘whale laundering’ ever exposed, is complicated and intricate. But that is partly how the industry has managed to get this far. Morgan’s nightmare is far from over. It continues to develop and we will continue to fight for her. We have documented horrific attacks by the other orca on Morgan and her self-mutilation wounds. Morgan has worn some of her teeth from chewing on the concrete. The trainers and vet of Loro Parque claim this is ‘normal’. 17 November 2013. If you find that we haven’t posted something recent on this website, please don’t be discouraged. We have been advised by insiders that the captivity industry monitors this website and Morgan’s facebook page and twitter account. Therefore we often don’t post time-sensitive documents and findings. This time-lag allows us to follow certain leads, gather further necessary evidence and then present robust data to you, those who truly care. Thank you on behalf of Morgan, for caring, for making a difference and for speaking out.